Red Dead Redemption is a fantastic game. It was last year when it was first released, it continues to be now and, in a decade or so when people look back at important videogames (again, since we all love doing it so much), Red Dead Redemption will stand out as a significant and crucial release. The reasons for this are many and have been detailed plenty of times elsewhere, particularly last year when it was the focus of everyone’s conversation, but it is still worth pointing out anyway because games like this don’t come along very often, and deserve all the attention that they can get. That is why, over a year since it released, I’m still going ahead with my own series of posts about the game -- simply put, it inspires a lot of thoughts and discussion, and I’m certainly not excluded from that fact. So, what do I think about the game? Well, as I’ve said twice now, it was my introduction to the Western genre, so it was especially interesting playing the game with that in mind, discovering and learning about the core qualities of that particular genre. 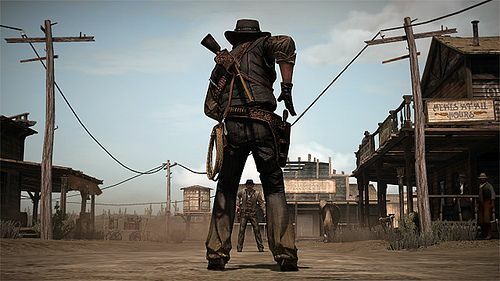 Perhaps even more fascinating, however, was how I came to realise that Red Dead Redemption is an even better take on the old Wild West because it doesn’t specifically focus on the genre’s tropes or quirks, and instead treats them as mere details in a much larger, broader experience. Beyond that, my fascination with game spaces saw another intriguing game to consider, given how incredible RDR’s environment is -- both in scope, and in detail. 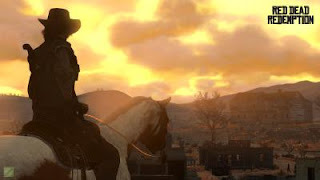 Of course, being a Rockstar game the atmosphere and sense of place in Red Dead Redemption isn’t surprising, but it’s still very interesting to think about because, I feel, the game stepped it up another level again -- even over Grand Theft Auto IV, in some respects. Finally, I was interested in the game because it seemed like Rockstar were intending to continue their more mature approach to their storytelling, first seen in Liberty City and GTA IV. While some characters are questionable, for the most part it really came across as if Rockstar were trying to pioneer, yet again, with Red Dead’s narrative, and the end result of that is remarkable, depending on the context. I will address the game’s characters, general plot and my connections to both in future posts but, for now, let’s talk about my introduction to the genre, and the game’s interesting use of its environment. Entering into a game (or any entertainment product, really) that adheres to a specific experience with no idea of what to expect is, somewhat, surreal. 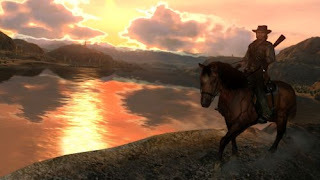 Red Dead Redemption’s general adoption of Rockstar’s open world template, however, ensured that there were enough features in the game that were familiar to me whilst I learned about all of the elements that were foreign: I knew about their emphasis on atmosphere and a sense of place in an expansive environment; I knew how the game ‘felt’ due to its similarities to Grand Theft Auto; and I was also quite familiar with the game’s structure of cut-scenes, objectives, and then rewards. This allowed my attention to be firmly focused on everything that was new (to me), meaning that I was able to get engrossed a lot quicker than I initially expected to. What I wasn’t expecting, however, was how the Western status of the game took a back seat to the rest of the experience -- it is a videogame based in a Western setting, not necessarily a Western itself. This was surprising to me because, before release, I was totally expecting the videogame version of a Western. That was how (I thought) the game was advertised throughout its hype campaign and the various previews and interviews, and that was what I wanted because, as I keep on repeating, I was new to the genre and wanted to use the game to see whether I liked it or not. And it did answer that question, too -- I did get to see what a Western entailed, and I did get to understand what my own personal stance on such a specific experience would ultimately be, but I acquired that insight indirectly as I engaged the whole adventure and not just certain aspects of it. On the surface, the tropes and incidental details that you’d expect from a Western -- duels, train robberies, cowboys saying “giddy-up”, etc. -- are present and accounted for but these traditional elements of the genre simply aren’t thrown in your face in Red Dead Redemption. Instead, they exist in the background: just like sheriffs and ranches do, like cacti and wolves, and, indeed, like the desolate landscape itself. They aren’t included in the game to ensure its authenticity to the genre or to inform its players that, yes, Red Dead Redemption is a Western; they’re merely details in a world full of them, and they give this world weight through their beautiful, delicate, coherency. Recognising that fact -- that RDR is a game with a Western setting, rather than one that is a Western -- took some time and didn’t occur until well after I had finished the game. But once I did acknowledge this subtle distinction, I realised that it enriches the experience in the same way that the little things do for other titles. Attention to detail is one of Red Dead Redemption’s most significant qualities, but I think it would be fair to say that most people wouldn’t think about what it does or doesn’t do with the genre as one of the areas in which the game carefully creates its overall experience. I would argue, however, that this is why the game is so remarkable to begin with: it took a genre from another medium, adopted the essence of it for a new one, and masterfully turned it into something that wasn’t just unique, it was only possible as a videogame. Not too long ago I wrote a post expressing my disdain with the notion that, eventually, Liberty City from Grand Theft Auto IV would be forgotten in favour of more impressive environments, perhaps even from another GTA. As technology and graphical fidelity continue to progress -- among other things -- I can see a future in which Liberty City is no longer considered a technical achievement or a sense of wonder, indirectly allowing for it to become a memory much in the same way that, say, the entirety of San Andreas has -- a particularly fond memory, undoubtedly, but a memory nonetheless. Well, unsurprisingly, I feel the same way about Red Dead Redemption’s magnificent depiction of the Wild West. Like Liberty City, I believe that the game’s environment is one of the best examples we have yet of a world that feels like it truly exists; only this time the game’s particular setting ensures that we’re revisiting a bygone era, rather than a modern metropolis. The sense of place, life and, of course, atmosphere in Red Dead Redemption is unparalleled, and somewhat conveniently exists as the demonstration of what the opposite of Liberty City could and should be. Instead of the urban jungle we have an expansive piece of land which teams with wildlife, sporadic hints of civilization, and which features a surprising amount of variety. I will address that last one in a future post but the point is that there is simply nothing like Red Dead Redemption’s landscape, and the fact that it is so incredibly detailed and full of unexpected surprises is not only a testament to Rockstar’s prowess with creating these virtual worlds in which we get to inhabit, but to their ability to showcase some of this generation’s most significant technical achievements, too. Few other developers can pull off such a large environment that is full with things to see and do, and fewer still can also provide a place in which key, personal moments can occur for each and every player. But it’s not about how impressive or special it can be; rather, it’s about how in the not too distant future I get the impression that, yet again, Red Dead Redemption’s landscape is going to be forgotten in favour of something else that is bigger, better, and certainly more beautiful. Right now that sounds absurd but we’re talking about a videogame, too -- the medium progresses at an insane rate and, as we’ve seen time and time again, it only takes a couple of years before a game is completely outclassed by something newer. Just look at the differences between The Elder Scrolls IV: Oblivion and The Elder Scrolls V: Skyrim for an example of what I am talking about: both games are amazing at the time of their release, but the inevitable iteration and technical advancements of the medium ensure that, eventually, they’re seen as less impressive and even, at times, ugly. As we reach and surpass the uncanny valley and photo-realism that problem becomes less significant but, right now, it’s still an issue and because of this I fear that, like Liberty City, Red Dead’s world will become nothing more than a memory for the majority of people because there simply won’t be any reason to visit it anymore. There will be better and, while I can’t wait to see what that might actually be myself, I also dread it because I personally believe that these environments that we already have now -- today, in the current generation -- should be cherished and even celebrated -- if not for their impressive coherency, than certainly because of all the resources, hard work and effort that went into making them. Ultimately this disdain I feel for the (potential) future of these game spaces is a personal thing that I have developed alongside my passion for virtual spaces as a whole, and while important it doesn’t necessarily reflect how I feel about the future. I’m eagerly awaiting what might appear on the horizon, and already have some idea of what that future entails with games like BioShock Infinite taking us to places that, once again, we cannot go in reality. The future is very bright when it comes to virtual worlds, but I’m not going to jump up and celebrate their arrival if, as a consequence, what we already have now is left behind and forgotten. That’s not the kind of approach I want to take with a medium I hold so dear, and that’s why I’m a little more reluctant to proceed than the majority of gamers out there. That’s some of my initial observations about Red Dead Redemption. A review, if you will, of some of the things that stood out to me upon the game’s completion. Naturally, being a Rockstar game means there is plenty more to talk about, and what I’ve covered above is only scratching the surface. In my next post I will discuss the opening moments of the game, and how they effectively set up the overall experience whether we realise it or not -- where better to start covering such a large game than the beginning? Interesting review! I can not wait to play it! To be honest I could not agree more with you that RDR will stand out in video game history. As you said it people assumed it would be a Grand Theft Auto in the Wild West but it was a lot more than that. This is probably one of the first times in video game history that I actually cared about the main character. He wasn't cheesy and the writing was top notch. Even though the ending bothered me a bit, it does not ruin the whole package. The greatest thing was the whole rockstar do what you want when you want philosophy actually made more sense in a Wild West setting. I would play the game to completion while my friend just played to shoot aninmals and skin them. 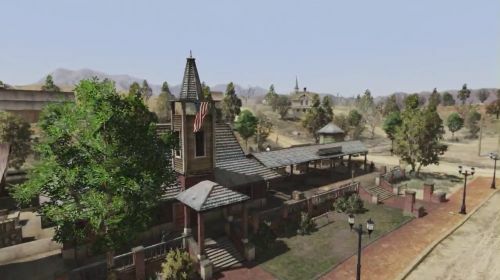 You mention the magnificence of the landscape in RDR, but I'm not sure exactly how much that has to do with graphical fidelity or technical considerations - after all this is an empty place, not a busy environment like Liberty City. I don't think RDR's greatest achievements are technical or visual. Like Minecraft this is all about space, and your relation to it. And in that regard I don't think it can be bettered by the next-gen, only equalled. Great game, great read, looking forward to your future posts. Whoa, I totally thought I responded to these comments. My apologies for neglecting you guys. Alexander -- Thank you. It wasn't intended to be a review but I guess that's exactly what it is since it sums up my general thoughts on the entire game. I'll be focusing on more specific subjects going forward, however, so keep an eye for that. Gaming in Public -- Yeah, freedom in the wilderness makes a lot more sense than freedom in, say, Liberty City, though obviously that has its own advantages too. I also feel as if Red Dead Redemption does everything that a Rockstar take on a Western can be, so there's no need for a sequel. Whether there will be one, well that remains to be seen, but I honestly hope there isn't because I think they nailed it on the first attempt. Time will tell. Alex_V -- I see where you're coming from, but I consider it to be a technical achievement (maybe not as impressive as the density and detail of Liberty City, however) because of the way in which Rockstar used silence and things like that to enhance, enforce and exhibit the world. The areas may have been farther apart and the land itself relatively empty, but through the framing of the terrain and the lighting detail, the aforementioned use of silence and subtle noises, and the activity of the places that were populated, I still think of the game as a technical marvel. It's absolutely the opposite of GTA IV's way of doing things, but it's because of this distinct change that I believe it also deserves the same level of respect. Red Dead Redemption had a little too much going on in its world, in my opinion. I got bored of its random encounters, and I couldn't understand why so many people were galloping around in such a hurry. That said, its world remains an incredible achievement, and that will always be so given the technology of its day. But it will be eclipsed and forgotten -- unless we get some HHHD remake in ten years. Lee Kelly -- I agree about the random encounters and actually plan on discussing them somewhat in a future post in this series, so it's nice to see that I'm not the only one who had problems with them. You're right, Red Dead Redemption's world (or what was achieved with it, at least) will be eclipsed, quite possibly in the same way that GTA V's environment has the potential to eclipse what was achieved with Liberty City in GTA IV (guess we'll find out in a few days). Even so I still think it's important to try and ensure that these environments as they become outclassed, aren't forgotten about. They may lose their impact as time progresses but they should never lose their respect, so I guess talking about it here (and in my Liberty Blues post) was my way of acknowledging what they represent, and how they affected not only me personally but the medium as a whole, too. As for your article, I have it bookmarked for a later date because I also plan on discussing the ending in my series and don't want any influences on my thoughts until then. You appear to have a decent blog on your hands, however, so you've been added to my RSS feeds as well. Thanks for stopping by and commenting, it's appreciated!